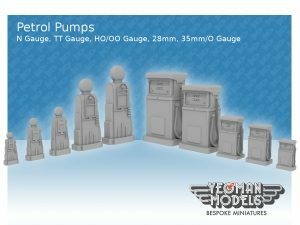 I have been selling my 28mm scale petrol pump models on ebay for some time now but recently I have made them in more scales and put them for sale of Shapeways. There are two types of petrol pump for sale, the 1940’s/1950’s style with it’s deco look and and the 1980’s boxy ones. Each one is now available as N Guage, TT Gauge, HO/OO Gauge, 28mm and 35mm. The new scales will be coming to ebay in the coming months. Also, you may notice on the left hand side of my Shapeways shop that the models have now been put into scale categories! It makes looking for items a lot easier! Check it out!